The subgenus Heriades Spinola occurs in the Palaearctic, Afrotropical and Oriental region. It contains 6 described species in the Palaearctic. 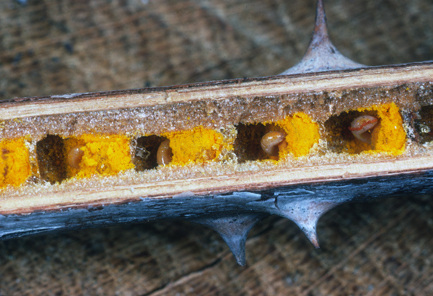 Nest of Heriades (Heriades) truncorum (Linnaeus, 1758) in a preexisting burrow of a pithy stem; the partitions between the brood cells consist of resin. Foto A. Krebs. 1856 Heriades crenulatus Nylander, Memoires de la Société des Sciences Naturelles de Cherbourg, 4: 111. Type material: f(f), “prope Parisios” [France]. Distribution-Europe: A,BG, BIH, BY, CH,CZ, D,E, E(Ba), F, GR, GR(Cr), H, HR, I, I(Sa), I(Si), M, MD, MK, P, PL, RO, RUS, SCG, SK, SLO, UA; Caucasus. Northern Africa: DZ, MA, TN. Northern Asia: KZ. Southwestern Asia: KZ, TR. Identification-Keys, Descriptions: Amiet et al. (2004); Banaszak and Romasenko (2001); Benoist (1929a); Friese (1898); Medvedeva (1978); Scheuchl (1996); Schletterer (1889). Flower preferences: Oligolectic on Asteraceae (Asteroideae, Carduoideae, Cichorioideae) with a preference for the subfamily Asteroideae (Amiet et al., 2004; Westrich, 1989; A. Müller, unpublished, based on 2 pollen samples from 2 different localities). 1938 Heriades Fertoni Benoist, Bulletin de la Société Entomologique de France, 43: 85. Type material: f(f), “Dellys” [Algeria], MNHN (Paris). Identification-Keys, Descriptions: No supplementary or more detailed morphological description known. Note: Male unknown. Flower preferences: Probably oligolectic on Asteraceae (A. Müller, unpublished, based on 3 pollen samples from 3 different localities). 1895 Heriades labiatus Pérez, Espèces nouvelles de mellifères de Barbarie, p. 21. Type material: f(f), [Algeria], MNHN (Paris). 1890 Heriades rubicola Pérez, Actes de la Société Linnéenne de Bordeaux, 44: 190. Type material: Syntypes m(m), f(f), “Bordeaux, Toulouse” [France], MNHN (Paris). 1892 Heriades copetica Morawitz, Horae Societatis Entomologicae Rossicae (St. Petersburg), 26: 149. Type material: Holotype m, “Germab” [Kazakhstan], ZIN (St. Petersburg).-Synonymy in Zanden (1994a: 170). 1931 Heriades crenulatus aurantifer Cockerell, The Entomologist (London), 64: 159. Type material: Lectotype f, by designation of Zanden (1994a: 170), “Asni” [Morocco], BMNH (London); paralectotype m.-Synonymy in Zanden (1994a: 170). 1935 Heriades hierosolomita Benoist, Bulletin de la Société Entomologique de France, 40: 277. Type material: f(f), “Palestine: Jérusalem” [Israel], MNHN (Paris).-New synonymy based on type material (A. Müller, unpublished). Distribution-Europe: A, BG, CH, CZ, D, E, E(Ba), F, GB, GR, GR(Cr), HR, I, I(Sa), I(Si), M, MK, P, SK, SLO. Northern Africa: DZ, MA, TN. Northern Asia: KS, KZ, TM. Southwestern Asia: CY, IL, IR, JOR, SYR, TR. Identification-Keys, Descriptions: Amiet et al. (2004); Benoist (1929a); Cross and Notton (2017); Friese (1898); Popov (1960b: 254-255). Flower preferences: Oligolectic on Asteraceae (Amiet et al., 2004). 1758 Apis truncorum Linnaeus, Systema Naturae, 10th edn, vol. 1, p. 575. Type material: Lectotype f, by designation of Kirby (1802: 259) [see also Day (1979: 75)], “in Europa” [Sweden], LSUK (London). Type species of Heriades Spinola.-Combination Hylaeus truncorum (Linnaeus) in Fabricius (1793: 305). Combination Megachile truncorum (Linnaeus) in Walckenaer (1802: 135). Combination Anthophora truncorum (Linnaeus) in Fabricius (1804: 379). Combination Anthidium truncorum (Linnaeus) in Panzer (1806: 252). Combination Trachusa truncorum (Linnaeus) in Jurine (1807: 252). Combination Trypetes truncorum (Linnaeus) in Schenck (1861: 347). 1802 Apis xanthogastria Schrank, Fauna Boica, vol. 2, p. 381. Type material: f(f), “um Ingolstadt” [Germany].-Synonymy in Warncke (1986: 115). 1808 Heriades sinuata Spinola, Insectorum Liguriae, vol. 2, p. 59. Type material: Holotype m, “Habitat prope Genuam” [Italy]. Synonymy in Praz (2017). 1841 Osmia punctatissima Lepeletier, Histoire Naturelle des Insectes, Hyménoptères, vol. 2, p. 329 [not seen]. Type material: Lectotype m, by designation of Peters (1971: 51), “environs de Paris” [France], MNHN (Paris).-Synonymy in Benoist (1931: 44). 1889 Heriades mordax Schletterer, Zoologisches Jahrbuch für Systematik, 4: 661. Type material: Holotype f, [North Africa? ], ZMHB (Berlin).-Synonymy in Schwarz et al. (1996: 115). Distribution-Europe: A, AL, AND, ARM, B, BG, BY, CH, CZ, D, DK, E, F, FIN, FL, GE, GB, GR, H, HR, I, I(Sa), I(Si), L, LT, LV, MD, MK, N, NL, P, PL, RO, RUS, S, SK, SLO, UA. Northern Africa: DZ, MA. Northern Asia: KS, KZ, RUS(FS), RUS(WS), UZ. Southwestern Asia: CY, IL, IR, SYR, TR. Identification-Keys, Descriptions: Amiet et al. (2004); Banaszak and Romasenko (2001); Benoist (1929a); Friese (1898); Medvedeva (1978); Romankova (1995); Scheuchl (1996); Schletterer (1889). Flower preferences: Oligolectic on Asteraceae with a distinct preference for the subfamily Asteroideae (Amiet et al., 2004; Maciel de Almeida Correia, 1981a; Käpylä, 1978; Westrich, 1989). 1931 Heriades wilmattae Cockerell, The Entomologist (London), 64: 159. Type material: Lectotype f, by designation of Zanden (1994a: 169), “Arround” [Morocco], BMNH (London). 1931 Heriades politulus Cockerell, The Entomologist (London), 64: 160. Type material: Lectotype f, by designation of Zanden (1994a: 169), “Ifrane” [Morocco], BMNH (London).-Synonymy in Zanden (1994a: 169). Identification-Keys, Descriptions: No supplementary or more detailed morphological description known. Flower preferences: Probably oligolectic on Asteraceae (A. Müller, unpublished, based on 6 pollen samples from 1 locality).